ARTI M. K., received her Ph.D. in Wireless Communications and M. Tech. in Communications Engineering from Department of Electrical Engineering, Indian Institute of Technology Delhi, New Delhi, India in 2014 and 2007, respectively. She did her B. E. in Electronics Engineering from Madan Mohan Malviya Engineering College, Gorakhpur, India in 1997. She is currently an Associate Professor with the Department of Electronics and Communications Engineering, Northern India Engineering College, Shastri Park, New Delhi, India. Her research interests include signal processing for multiple-input-multiple-output systems, cooperative communications, and satellite communications. Multiple-input-multiple-output (MIMO) relaying techniques received significant interest because of their advantages like increased capacity, data rate, diversity gain, and array gain. There are many relaying strategies are proposed in the literature like amplify-and-forward (AF), decode-and-forward, selection relaying and incremental relaying. AF is the most appealing technique among all cooperative protocols because of its simple processing at the relay terminals. A key assumption in most of the works over AF MIMO relaying is that the instantaneous channel state information (CSI) is perfectly known at different nodes involved in cooperation, in literature. However, in practice, exact CSI is not available at different nodes and MIMO channel matrices have to be estimated at different nodes by using training data. In this book, we discuss methods of channel estimation and decoding in AF based MIMO relay networks. We explain three different decoders, namely decoder-I, decoder-II, and decoder-III, for orthogonal space-time block codes (OSTBCs) using pilot symbol-aided channel estimation over Rayleigh fading MIMO channels, in an AF based cooperative communication system. Decoder-I is a decoupled decoder which uses estimated channel gains in decoding. The other two decoders jointly process the received pilot signals and data samples through vector derivative (decoder-II) and probability density function marginalization (decoder-III). Decoder-II and decoder-III have almost the same performance. However, decoder-II is computationally less complex as compared to decoder-III. Next, we investigate the problem of channel estimation and decoding of OSTBCs in a two-way AF MIMO relay network. We explain joint decoding for a pilot symbol-aided two-way AF based MIMO cooperative system. This decoder jointly processes the received OSTBC data and pilot matrix by using the vector derivative over the two-way MIMO relay channel. Some analytical metrics of the joint decoder are also studied. 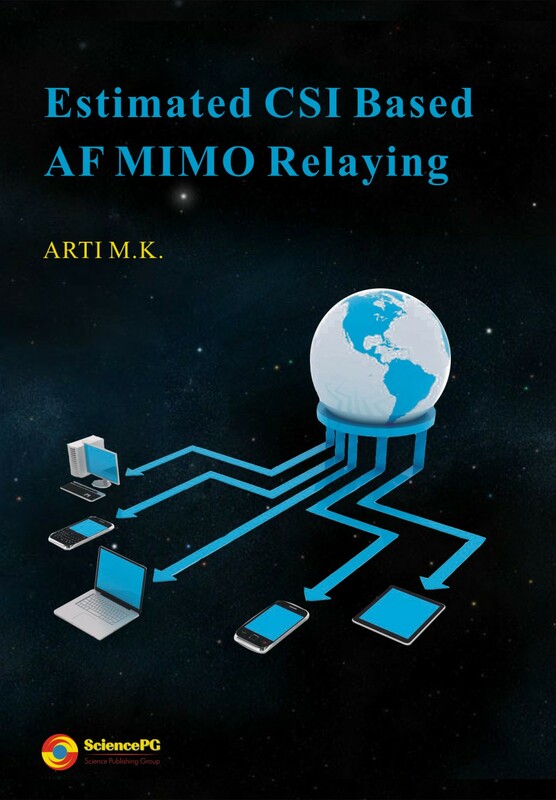 Furthermore, we study an AF based one-way MIMO cooperative relay network in which beamforming is done by using estimated channels in a Rayleigh fading environment. A protocol for training of the source, relay, and destination is described and methods of channel estimation are presented. Moreover, we also consider a beamforming and combining scheme for a two-way AF MIMO relay network. The analytical SER and diversity order of the scheme are studied. We also discuss beamforming and combining in a two-way AF MIMO relay system with estimated channel gains.